June 29, 2018. Thirteen days ago. I’m sitting in the Grand Ballroom of the Capital Hilton Hotel in Washington, DC, soaking in the presentations at the Annual Conference and CEO Summit of the Association for Community Affiliated Plans (ACAP). ACAP has grown to be quite the force for Medicare Advantage and Medicaid health plans around the country. So, the conference is an important event for Medicare and Medicaid professionals. I’m looking forward to the 3:30 p.m. session, Plans Involvement in the New World of Work Requirements, because Mark Carter and Carl Felix, CEO and COO, respectively, of Kentucky’s Passport Health Plan, are going to describe their efforts to implement the Bluegrass State’s Medicaid work requirements. In early January, 2018, Kentucky became the first state to win CMS approval to institute work requirements for its Medicaid beneficiaries. 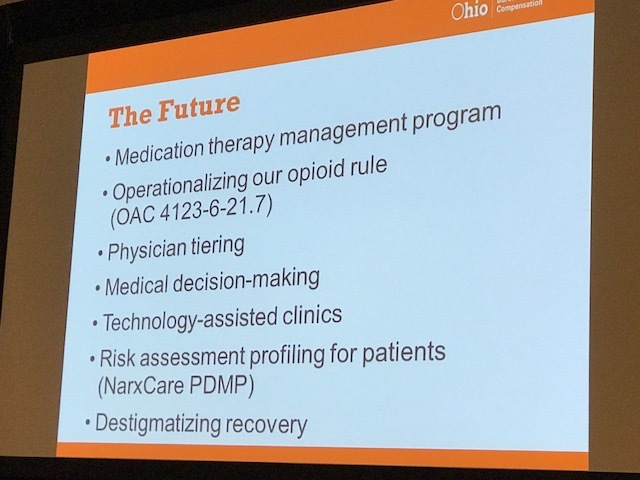 As I sit in the Hilton’s ballroom, its new Medicaid work requirement program, Kentucky HEALTH, is slated to go live in two days (state government is only outdone by the US Army in its genius-like ability to create acronyms; this one stands for Helping to Engage and Achieve Long Term Health; catchy, eh?). There’s a pesky lawsuit lurking in the wings aimed at getting the Court to declare the program unconstitutional, but on June 29 Kentucky bureaucrats are ready to drop the hammer. So, I am really interested in learning about the looming work requirement program, because three other states have won approval and are putting their programs together, and more are waiting in the wings. Unfortunately, at the last minute, Mark and Carl (remember them?) have to cancel, because in the mad dash to the finish line for Kentucky HEALTH’s launch, they actually can’t leave the office. But, not to worry. Kentucky HEALTH’s Chief Marketing Officer is here to fill us in. For the first time EVER, Kentucky’s Medicaid beneficiaries will have to pay premiums. The premiums aren’t a lot (to you and me), ranging from $1 to $15 per month. Pregnant women and children are exempt. Individuals with income above the poverty level ($12,060) who do not pay their premiums in 60 days will be kicked out of coverage for six months. Enrollees can return to the program earlier if they pay two months of missed premiums and make one new premium payment. They also must complete a financial or health literacy course. Individuals must either work, volunteer, be enrolled in schooling or do some kind of “qualified community engagement” for at least 80 hours per month. Beneficiaries must report their work activity each month; failure to do so will cause Medicaid disenrollment for six months. Healthcare providers will have to certify to the Commonwealth the health status of those individuals they deem physically unable to work. For a moment, put aside why Kentucky is going to all this trouble. The bottom line question is: What does it get for going to all this trouble? In its need to get freeloaders off Medicaid rolls, just how many people would Kentucky’s work requirements actually put to work? About 10% of Medicaid recipients are elderly, age 65 and older, and many of them are in nursing homes. About 48% are children, age 18 and younger. That leaves about 42% who are of working age and potentially subject to the requirements. Of that 42% who could be subject to the rules, 42% of them are already working full-time, and 18% are working part-time. Another 14% are not working due to illness or disability. Six percent are in school. Twelve percent are caregivers for family members. All of the above would be exempt from Kentucky’s rules. That leaves about 1% of all Medicaid beneficiaries who would qualify for a work requirement program like Kentucky’s. That’s about 740,000 people nationally and around 12,000 in Kentucky (Since 2014, when Kentucky accepted Medicaid expansion, its Medicaid population has about doubled, rising from around 650,000 to 1.2 million) . Kentucky HEALTH’s CMO wouldn’t (or couldn’t) say how much the state has spent on putting the program together or how many people have been devoted to it. But its best case scenario is that out of 1.2 million current beneficiaries about 95,000 may be off the rolls in five years, because either they no longer qualify for Medicaid because they either make too much money due to full-time work or they fail to comply with work requirements. The day after the Kentucky HEALTH presentation at the ACAP conference District court Judge James Boasberg ruled Kentucky’s plan unlawful, because the federal government is obligated under federal law to consider whether a Medicaid proposal advances the program’s objectives, the judge wrote, and the Trump administration failed to meet that standard before approving Kentucky’s plan. Posted in health care, Industry Events, Law, State News | Comments Off on Quo Vadis, Kentucky? So, much has been done, but much remains to be done. 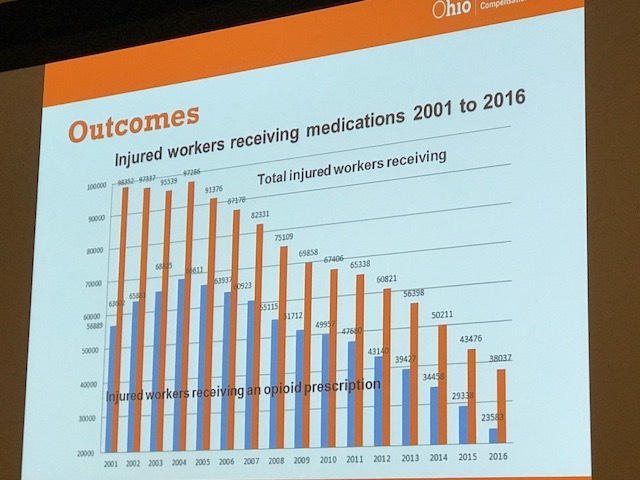 One of the many things that might be making a difference is this: Outside the box of the claim, Ohio BWC will pay for 18 months of treatment as long as the injured worker/patient complies with the treatment guidelines. This is innovative, but the Bureau doesn’t have outcome data yet. 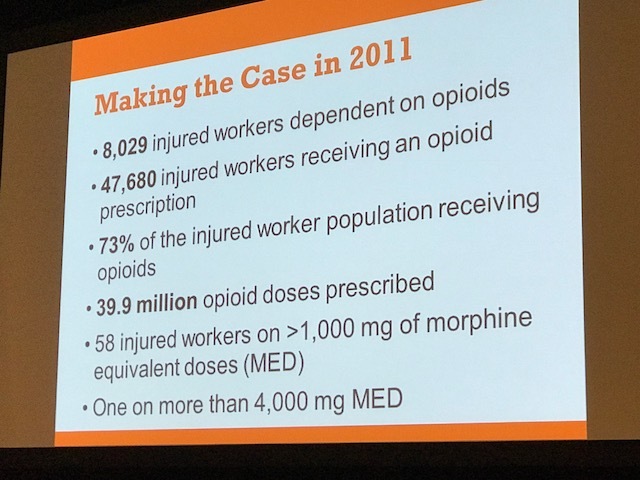 Dr. Welsh pointed out that, as you can imagine, the program isn’t very popular with opioid-dependent injured workers. The program asks them to give up the opioids they have come to know and love for the rest of their lives. A wickedly difficult thing to do. Regardless, the Ohio BWC should be complimented for the measures it has taken to attack this national horrendoma. What about the future. There’s a long way to go, but the Bureau has charted a way forward, although it’s a mighty hard road with a lot of potholes, deep and wide. The Ohio Bureau is working tremendously hard on this issue. 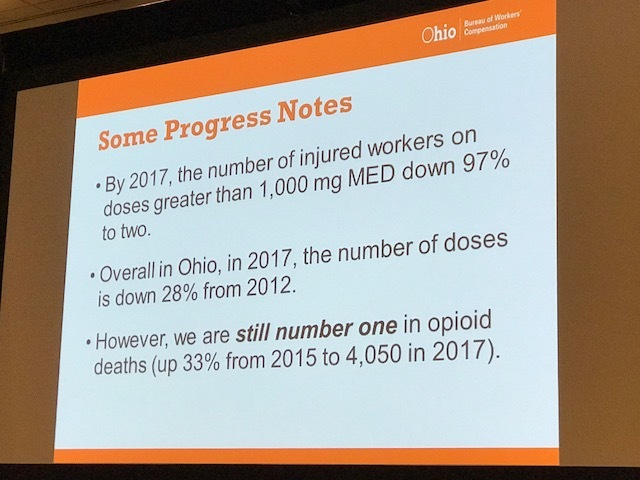 The people in it are dedicated and committed to doing all in their power to rescue the many workers who have fallen into the opioid pungy pit. The emphasis they place on the last bullet of the last slide is critical for winning the battle. Dr. Erica Groshen, former Commissioner of the U.S. Bureau of Labor Statistics, began this year’s conference. She is currently Visiting Scholar at Cornell’s Industrial Labor Relations School, and if anyone knows anything about the future of work, it is Dr. Groshen. Labor market conditions: Since the end of the Great Recession, the U.S. has added 9.3 million jobs. As most of us have observed, the service industry has seen the most labor growth over the last year: professional, leisure and health services. The country’s unemployment rate is 4.1%. Dr. Groshen peeled that onion in discussing labor “underutilization.” She described how in addition to unemployment, underutilization, which addresses discouraged workers, marginally attached workers and part time workers who would prefer full time. That 3rd group stands at 8.2% of the population. Of the unemployed population, 20.7% are long-term unemployed. As further proof of the tightening of the labor market, currently for every job opening, there is 1.1 unemployed person. This seems low, but it’s about where numbers stood before the Great Recession. Next, Groshen dove into a subject of great concern to me: wage growth. Essentially, there hasn’t been any since 1974. Real wage growth (wages adjusted for inflation) has been 0.0% over the last 12 months. Additionally, Dr. Groshen expressed significant concern about the relationship between productivity and wages. Until 1973, wages and productivity tracked on a one to one basis. 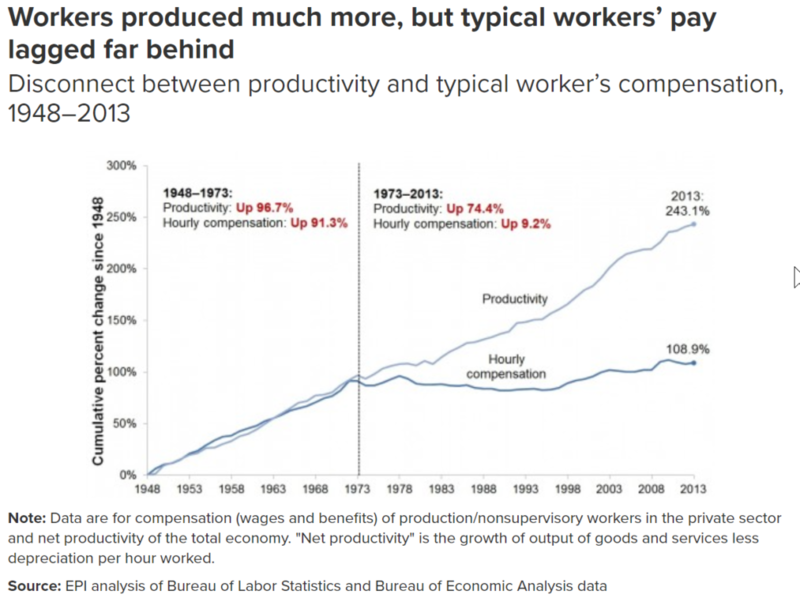 Since then, productivity has soared and wages have been essentially stagnant. The Gig Economy: BLS doesn’t know much about the Gig economy. You read that right. BLS “periodically” surveys 100,000 workers to determine the prevalence of what are called “alternative work arrangements.” Trouble is, the last time that happened was in 2005 (according to Groshen the failure of BLS to perform a really current survey is due to lack of funding). Given what’s happened to our economy since then, 2005’s data is pretty irrelevant. The BLS Current Population Survey, on the other hand is “current,” but what it shows is paradoxical in that there doesn’t seem to be any effect from what everyone perceives is a major shift in work and employment due to the emergence of the Gig economy. Groshen reported that in May 21017 BLS secured funding to conduct a new Contingent Workers Survey. We’ll have results, which will be of tremendous interest, in the near future. Artificial Intelligence: Dr. Groshen considers AI as something that “replicates routine brainwork.” When AI is applied to routine work, for example, human coding of information, the result is higher quality work done by fewer people who handle the tricky work that humans need to do (at least, until now). As AI rises in society, many jobs will be lost, but many jobs will be created. The same thing happened when we moved from an agricultural society to an industrial one. Groshen believes this will happen, but that producing the new jobs will take time, which will make things difficult for those who will be swept aside by growth in AI. Displaced workers, according to Groshen, can lose one to four years of income, which will be devastating for many. This will require government policy changes to help bridge the gap in employment. Good luck with that. 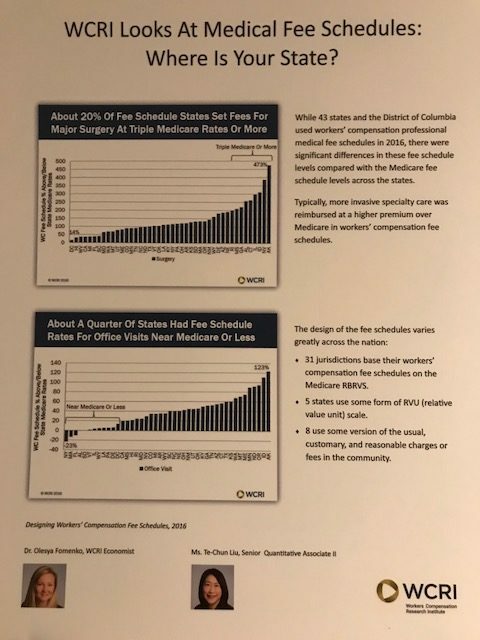 Official Statistics: Dr. Groshen emphasized the importance of “official statistics,” pointing out that, “We do not have a single statistical agency in America. We have 17 of them.” The BLS, established in 1884, is the gold standard and biggest of them all. She claims national stats are a public good. Who uses BLS statistics? The federal government, state and local governments, businesses and households (The most popular part of the BLS website is the Occupational Handbook). There are challenges facing the BLS. Cybersecurity is, of course, a major one. Groshen reported that BLS has never had a data breech (to which I reply, “That we know of). Another challenge is, wait for it – Funding. From 2009 to FY 2019, nominal funding has been flat, standing at $609 million for FY 2019. However, if BLS had been funded at the rate of inflation, FY 2019 would be $715 million. Dr. Groshen closed with a plea for help. BLS needs help in the form of money. Business has to do a better job of advocating for better and more data, data it relies on to make important decisions. Amen to that. I think this is great for the attendees. Meet friends and colleagues, grab a cup of java and get some sophisticated education at the same time. Kudos to whoever had this idea. For the last decade, injury frequency has been trending steadily lower. There are a number of reasons for this: automation, loss of manufacturing jobs, better safety engineering, etc. Injury severity, however, has not followed suit despite technological gains in claim administration and medical management and an ever so slow move to the use of predictive analytics. This creates challenges for employers, especially of the small and middle market variety, and, to a certain degree, even for a few national, enterprise accounts who find themselves pretty much where they were ten years ago in terms of style and policy with respect to workers’ compensation. One reason for this is the deep rooted legacy mentality and resistance to change of many insurers and Third Party Administrators. In many ways, these organizations remind me of flies circling around a light in a lampshade, mistaking movement for progress. However, employers still foot the bill and are still in command. Keeping in mind that the workplace is the best place to control workers’ compensation costs, employers still need to build and maintain solid programs to prevent and contain loss. Case in point is Bob Oberosler, Vice President of Loss Prevention for Rite Aid, a national pharmacy chain. At the New Jersey Self Insurers Association’s Annual Meeting a couple of weeks ago, he described his company’s work to craft a forward thinking loss prevention and workers’ compensation management program and communicate it to employees who are far and wide, indeed. But before that could happen, Mr. Oberosler said, he faced an even more daunting task – getting management’s commitment and buy-in to the effort. The good news is this happened and Rite Aid has been enjoying some spectacular results because of it. This got me thinking. In order to sustain C-Suite commitment, a risk manager, or Loss Prevention VP, such as Bob Oberosler, needs to provide the Leadership team a steady, easily understandable Performance Measurement Results Dashboard. So, what should be the characteristics of such a Dashboard? Performance measurement should have four characteristics: It should be simple, it should be meaningful, it should be consistent and it should be continuous. By simple, I mean easily and quickly understood by senior management. Meaningful means that it should sit in senior management’s sweet spot; it should be something that is anticipated and valued by leaders. It should be consistent, because those leaders, once trained to view performance in one way, do not appreciate abrupt course changes. And to be effective over the long term, it has to be a continuous and routine process. The mantra should be: What is consistently well-measured is highly valued. With this framework in mind, I usually recommend that monthly or quarterly reports to senior management measure two things religiously: Incurred losses per full time equivalent employee (and this should be done by department, division and company) and incurred losses per every hundred dollars of payroll (again, split out by department, division and company). Before any measurement occurs, however, management should settle on targets, which should be a bit of a stretch, but attainable. And target selections should be set against actual performance in the prior three or four years. For instance, if costs per FTE have been in the $200 to $300 range in the last few years, a good target would be a reduction of 30% to 40% in the current year. Senior managers have finite attention spans. Therefore, workers’ compensation performance measurement should fit on one page, a Scorecard that senior management can assimilate in no more than a few minutes. If the information is pithy enough, that’s as long as it should take, but it should also lead to fruitful discussion about management actions to enhance performance, discussion that comes out of knowledge. There are many other solid and valuable workers’ compensation metrics, but, in Lynch Ryan’s experience, these two are the ones that senior managers appreciate the most. All of this assumes, of course, that, as at Rite Aid, a serious and ongoing safety, workers’ compensation and injury management program is humming along and that all parts of the organization have been trained in how to keep it that way. Yesterday, while attending WCRI’s Annual Conference in Boston, we wrote about the National Academy of Sciences (NAS) new research results concerning the effectiveness of medical marijuana (cannabis) in the treatment of chronic pain. The NAS research concluded there is “conclusive support” that cannabis is effective with respect to chronic pain. A number of states are allowing cannabis to be employed in this regard. However, marijuana is federally illegal in any usage, medical or otherwise. A freshman Republican representative from Virginia introduced legislation this week that would end the federal prohibition on marijuana use and allow states to fully set their own course on marijuana policy. The bill seeks to remove marijuana from the federal Controlled Substances Act and resolve the existing conflict between federal and state laws over medical or recreational use of the drug. It would not legalize the sale and use of marijuana in all 50 states — it would simply allow states to make their own decisions on marijuana policy without the threat of federal interference. ‘‘Virginia is more than capable of handling its own marijuana policy, as are states such as Colorado or California,’’ Representative Thomas Garrett said in a statement. Neither recreational or medical uses of marijuana are allowed in Virginia. Senator Bernie Sanders introduced a similar bill last year, but no one would co-sponsor it, and it never even got a hearing. Garrett, however, has four co-sponsors already. We will continue to watch this. A Conversation With WCRI’s John Ruser, Ph.D.
As I write this, we are 34 days from this year’s not-to-be-missed Workers’ Compensation Research Institute’s Annual Conference. It all happens at the Westin Copley Place on March 2 and 3 in the greatest city in America. That would be Boston (sorry New York, Chicago, LA and all the rest of you). This is always one of the top conferences in the nation, jam packed with enough data to satisfy any green-eye-shaded, algorithm loving, analytic modeler. As you might imagine, this year’s agenda will include a bit of crystal ball gazing with respect to the future of American health care. I discussed that and other conference topics recently with Dr. John Ruser, WCRI’s President and CEO, at the Institute’s Cambridge, MA, offices. This is Dr. Ruser’s first full year at the WCRI helm. About a year ago he succeeded Dr. Richard Victor, WCRI’s founder and iconic long time leader. Ruser, a perceptive intellectual, realized he had big shoes to fill, so he told me his goal for the first year was “stability.” He wanted a “steady transition.” That’s one goal he can check off as done. No staff left and they all continued to do significant research, much of which will be on display at the upcoming conference in the world’s greatest city. Going forward, Ruser knows it’s time for him to begin making his mark at WCRI. This former Bureau of Labor Statistics executive wants to “increase WCRI’s reach.” He’s commissioned the building of a new website with the aim of “producing a much better search engine,” which will allow for “easier access to the Institute’s work.” I asked him what that really meant? He said he realizes that the work is scientific in nature, but that doesn’t mean it has to be obscure. He’s looking for plain english with a more “pithy” language style for Abstracts and Research Briefs. Doing so will allow WCRI to reach more stakeholders. A worthy goal, and we wish him luck. What impact will the 2016 election have on healthcare (ACA, Medicare, etc. ), labor and the workforce, and workers’ compensation? Is the workers’ compensation system still fulfilling its mission or does it need revisiting? With opioid use decreasing, what alternatives exist to treat pain? The conference’s agenda is interesting, for sure, but for my money I’m eager to attend the first and last sessions. The opening session is on “The Impact of the 2016 Election,” and the presenters are former U.S. Representative Henry Waxman and former U.S. Senator Tom Coburn. I think that’s where the crystal ball gazing happens. We all know workers’ compensation is the tiny caboose at the end of the great big health care train. It remains to be seen whether the former Senator and former Representative will get deep into the weeds of what the coming blow up of the Affordable Care Act will do to that little caboose. A year from now we’ll see how prescient Waxman and Coburn have been. The last session is at 10:35 AM on Friday morning (don’t leave early). This is the first session’s complement and is likely to get into some of the Grabell/Berkes territory. “Appraising the “Grand Bargain” in 2017″ has four wonderful presenters, all of whom I admire. Professor Emily Spieler, Northeastern University School of Law, Dr. David Deitz, Principal, David Deitz & Associates, Dr. David Michaels, Former Assistant Secretary of Labor for Occupational Safety and Health (OSHA) and Bruce Wood, of the American Insurance Association are going to take a hard look at workers’ compensation in the here and now. Their comments should bookend nicely with those of Henry Waxman and Tom Coburn. As we were winding up our talk I asked John Ruser what he hoped would be the biggest takeaway for attendees. “Honestly,” he said, “I want everyone to come out feeling they’ve learned something, something important.” Amen to that. This year’s conference promises to be well-attended, but if you’re going (and you should be going), you might want to book your hotel now. WCRI has reserved a block of rooms at a special rate of $246 per night. They will go fast. You can register here. I hope to see you soon in the Milky Way’s greatest city. Today we’re participating and helping out at the Central New Jersey Claims Association’s annual golf event. We’re at Mercer Oaks Municipal Golf Course in Windsor Township. There are seventeen foursomes roaming the links trying not to hurt themselves or anyone else. The proceeds of the event go to Kids’ Chance of New Jersey, a wonderful organization providing scholarships to children of workers who have been “seriously, catastrophically or fatally injured in a work-related injury.” The three New Jersey claims associations, led by the Central (you guessed it – the others are North and South), are deeply serious about helping these children. The New Jersey chapter of Kids’ Chance was formed in 2012 when the Central Association awarded its first scholarship. This year the number rose to 15 and totaled $125,000. Claims adjusters sometimes have to deal with awful stuff, workers who are profoundly injured, sometimes killed. Every once in a while they get to see tragedy up close and personal, families devastated by the loss of a parent due to a workplace injury. That sort of thing is difficult to deal with; it can harden a person. It’s gratifying, indeed, to see this group of adjuster professionals giving so much of themselves (and having a good time doing it!) to help children victimized so early in life. Each year, April 28 is designated as Worker Memorial Day, a day to mourn the dead and recommit to safety in the workplace. Despite progress in reducing on-the-job deaths, 13 workers are killed at work every day, with many more suffering grievous and life-changing injuries. Here are some sites and resources commemorating the day. Workers’ Memorial Day is observed every year on April 28. It is a day to honor those workers who have died on the job, to acknowledge the grievous suffering experienced by families and communities, and to recommit ourselves to the fight for safe and healthful workplaces for all workers. It is also the day OSHA was established in 1971. Under the Occupational Safety and Health Act of 1970, employers are responsible for providing safe and healthful workplaces for their workers. OSHA’s role is to ensure these conditions for America’s working men and women by setting and enforcing standards, and providing training, education and assistance. OSHA provides a clickable map to find activities near you. This year marks the 45th anniversary of the effective date of the Occupational Safety and Health Act and the creation of the Occupational Safety and Health Administration (OSHA). The Act — which guarantees every American worker a safe and healthful working environment — created the Occupational Safety and Health Administration (OSHA) to set and enforce standards and the National Institute for Occupational Safety and Health (NIOSH) to conduct research and investigations. This year also marks the 47th anniversary of the Coal Mine Health and Safety Act, and 39th anniversary of the Federal Mine Safety and Health Act. The Occupational Safety and Health Act is 45 years old, and is out of date. Millions of workers lack coverage, penalties are weak and worker and union rights are very limited. In 2014, nearly 4,700workers were killed on-the-job by traumatic injuries and an estimated 50,000 – 60,000 died from occupational diseases. On an average day, more than 10,000 workers are injured or become ill because of workplace hazards, and 150 workers lose their lives as a result of workplace injuries and diseases. See events listed by AFL-CIO, as well as this year’s fact sheet. John Geaney’s been a friend for years. And why not? He’s a Holy Cross and Boston College Law School grad, as well as a Red Sox fan. So, in a way we’re Boston Brothers. But that’s not important. What is important is that John Geaney is recognized as the pre-eminent New Jersey attorney focusing on workers’ compensation. He heads the workers’ compensation practice for Capehart Scatchard, one of New Jersey’s foremost law firms. There are nearly 40 attorneys in John’s practice department. John is the author of “Geaney’s New Jersey Workers’ Compensation Manual for Practitioners, Adjusters, and Employers,” and updates it annually. If you have anything to do with workers’ compensation in New Jersey, you need to have John Geaney’s Manual. 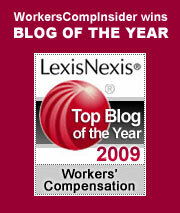 In addition to representing a great number of New Jersey’s premier employers, writing a Lexis Nexis Top Blog (a really good one!) and creating the aforementioned Manual, John, teaming with Millennium Seminars, puts on three seminars each year for New Jersey professionals specializing in workers’ compensation. I’m writing this from today’s seminar in Mount Laurel. I’m attending with Richard Filippone and Mary Ann Kezmarsky, founders of Work Comp Psych Net, a seminar exhibitor and a Lynch Ryan client. 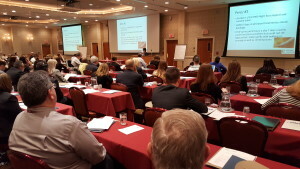 There more than 100 New Jersey workers’ comp pros here, and all of them are highly engaged. Moreover, Geaney’s seminars are always fully subscribed. Attendees keep coming back, and that doesn’t happen by chance. Geaney is charismatic on the podium. The presenters are interesting, articulate and well-regarded. It’s considered a high compliment to be invited to present here. Around the nation, most states have one, perhaps two, people who set the professional standard for everyone else in their state. In New Jersey, that person is John Geaney.